Nicholls, D. (2014). The mental health imaginary vis-à-vis its nurses and Australian environs: an essay Journal of Research in Nursing. 19:580-589. The work reviewed takes a unique exploration of the future of mental health nursing in the Australian environs. To do this, the author work presents an historical account of what it may have been like to be a mental health nurse in Australian in the late 1900s. This account is a philosophical view that does not necessarily aim to resolve an issue, build a theory or seek agreement, but instead is a philosophical work taking shape from the author’s lifeworld. My review discusses the progress, challenges and complexities of the mental health context, highlighting that they are not of uniqueness or of singularity to mental health nursing. Instead, aspects of the author’s lifeworld and the mental health imaginary vis-a`-vis its nurses and Australian environs has a broader application to the discussion of changes over time related to nursing and its natural attitude, education, and culture. Ranse, J. (2014). 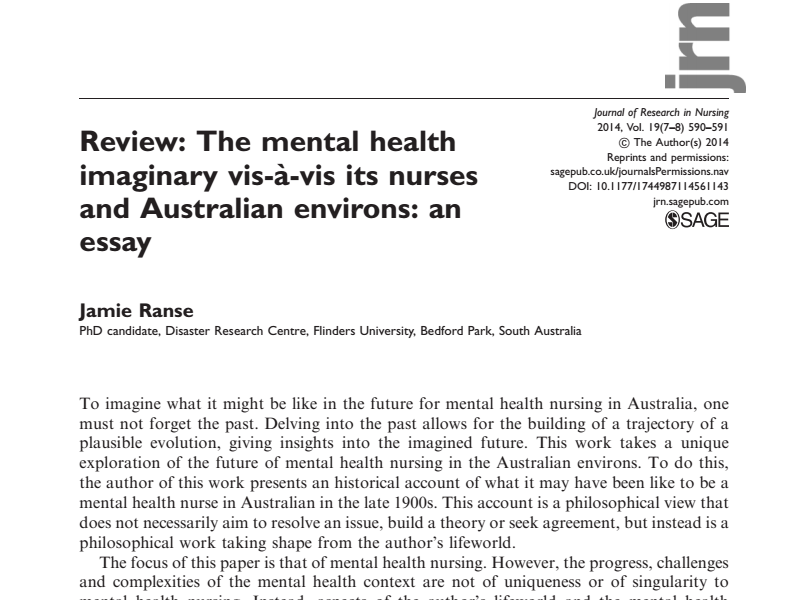 Review: The mental health imaginary vis-à-vis its nurses and Australian environs: An essay. Journal of Research in Nursing. 19(7-8):590-591.